Jake wore his firefighter suit to school Friday. He said it was super-hero day, and chose the fireman. He knew it wasn’t Superman, and asked if a fireman was a super-hero. I said they were to me. (He really, really wanted to wear that costume) He changed during the day, but I thought it was adorable. We had a crazy, wild week. 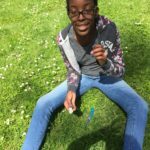 If you’ve been reading this blog for any time, you know that we are quite busy and active all the time. This week made those weeks look calm and boring! But, I’m here to say, we we able to keep it quite frugal throughout it all, while having lots of fun in the meanwhile. I mean, how could I NOT have fun with such a cute fireman? Where Jake is concerned, the bigger rocks were better! On Tuesday, we went to visit Harnet and Danite with my sister Rosalie. This time, we met at a park on the Willamette River. 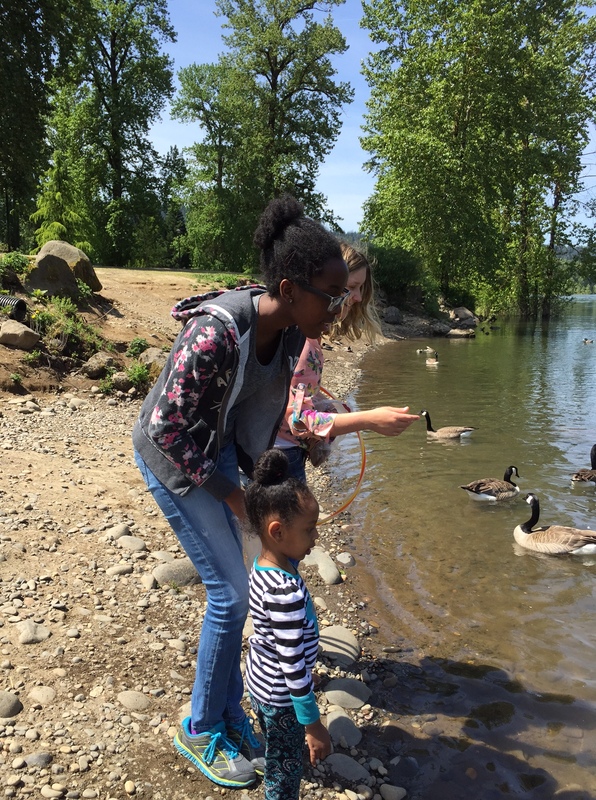 There were ducks and geese to feed, playground equipment, a picnic area, and more. We kept it frugal by bringing food. Each one of us 3 ladies brought enough for all of us–we had to chuckle at the amount of food there was! The girls are really loving getting to know Dinuite. She, in turn, is loving them and often insists that they are coming, even on days they aren’t. Her mother, Harnet, is taking classes at community college, working on English and citizenship. She is getting better and better at English each month and we can really tell a difference when we see her. We kept it frugal and fun by taking a picnic, old bread for the geese and ducks, and simple, inexpensive toys to keep little Danuite busy. I started planting a few seeds on Tuesday night, but couldn’t start until 7 because I was at work, so I had much more to do. By Wednesday, I was getting nervous. Rob had spent hours tilling it up and getting the dirt into good shape over the weekend and Monday evening, and it was going to rain on Thursday. The girls and I did some crucial bookwork and then ran to Wilco for some starts of both veggies and flowers. I purchased only what I thought I could get planted before the rain. The girls helped me and we got the garden planted, and even 1 flowerbed. I finished late afternoon/evening once they had moved on to other activities. I was so glad I did. Once it started raining, it poured, and hasn’t stopped since. 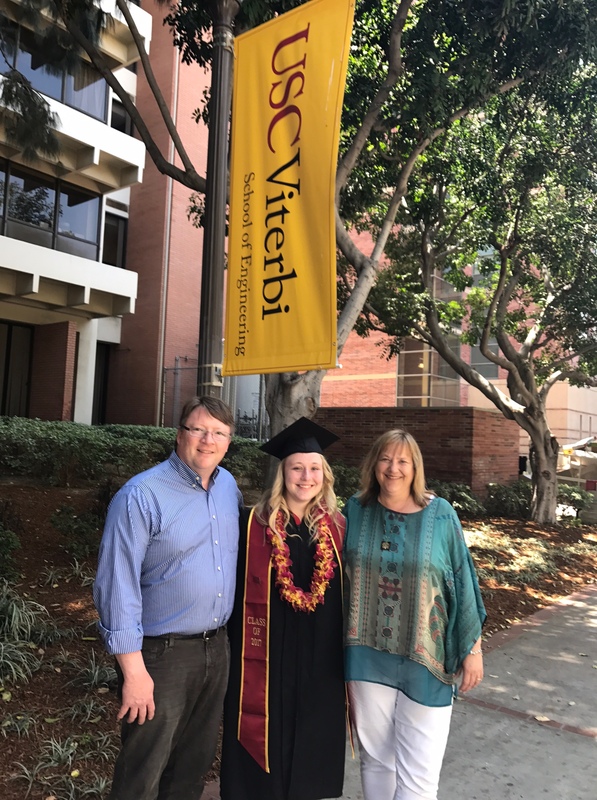 On Thursday, Gail and Ron took off for a few days to see their oldest daughter, our niece, Caitlyn, graduate from USC. We took care of the kids. I’m happy to say that we had a good weekend. We are so proud of her. Her degree from USC is bio-chemical engeneering–whew! 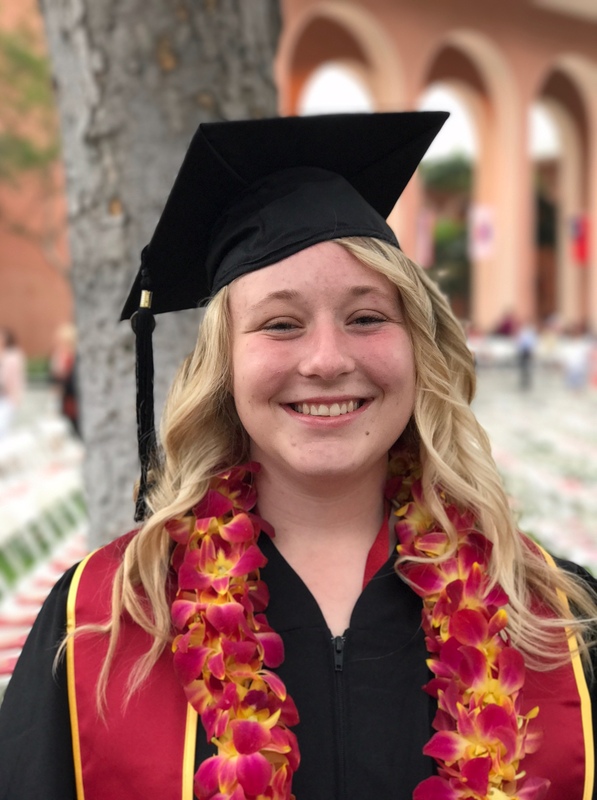 She graduates again at Biola University in a few days–she was in a special program between the 2 schools. She will have 2 degrees now, one from each school. Although I’m not exactly sure of the names of all her degrees, I am supremely sure that it was extremely difficult, and I’m so glad she’s made it through. I will say the weekend was a blur of cooking and cleaning. Rob and I divided and conquered, and I slept over there 2 nights, and brought Michaela over here 1 night. She doesn’t like to be away from home, so that was a stretch for her. Jake slept at my house with uncle and cousins 2 nights. Overall, I was pleased with the amount of cooking I did for everyone, and the lack of eating out. It did take a fair bit of planning to make sure we had everything we wanted at the whichever house we were at, but we stayed within our budget with the few items that were eaten out and used a lot of food from the grocery store to keep everyone fed and happy. I feel like we had a good balance. We did not pay for entertainment this time–no movies, etc. We were just too busy with scheduled activities, chores and cooking. It went well, and the children were terrific! Now it’s off to bed with me…I’m wiped out! Fun, but tiring–that’s for sure. Sounds like a really great week. I don’t mind busy if it means everyone is healthy and having fun. That’s how you make memories. 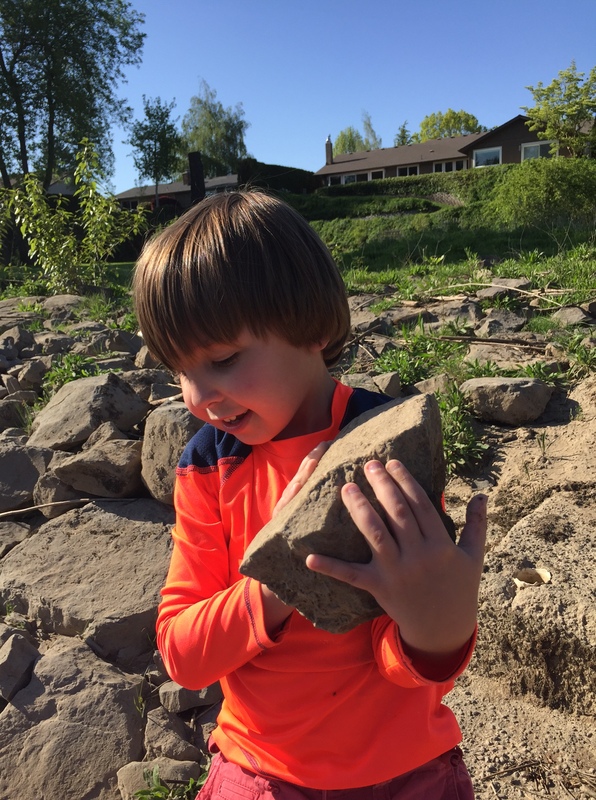 I’m sure your son will always remember how you took him down to the river to through rocks in. I actually like to be busy, too. To clarify, Jake is my nephew, actually. Along with family time, which we have as well, I am a personal support worker for both Jake and his sister, Michaela. That means that I spend specific time with each of them, helping them do activities that help them grow and develop, since they each have special needs. These things might include hygiene activities like getting them to brush their teeth, bathe, and more. I also help them learn to do chores like clean their rooms or take out recycling, etc. –we do it together. I also do activities with them, such as bowling, reading, game playing, shopping, cooking, and rock throwing! I am paid for this through Developmental Disability Services (DD Services) and they have criteria that I need to follow, such as some documentation of what we worked on, etc. They each have goals that we work on. I’m also the one to go fetch them at school when they get sick, if their parents are at work, and take care of them. My husband is also a PSW, so occasionally he works a few hours at this when we have both kids at once, but his time for that is limited since he works at another job. I homeschool my daughter Ja’Ana, and my niece, Alissa, during the day time and start doing PSW work with the other 2 around 2 pm, several days a week, plus some weekend work. This past weekend was some hourly billing, some overnight billing (they have a few days per year of that for when their parents need respite as they did this weekend) and a few hours just for fun. I have 8 kids. Patsy (12)and Ja’Ana (16) are the youngest. They are at home full-time. Patsy goes to public school and Ja’Ana is home-schooled. Lovana (21) is working away from home 5 nights a week, care-taking for an elderly woman. That be be over soon, and she will search for another job. She also takes college courses on-line from a local community college. The other 5 kids are grown and going about their own business. Alissa (16), Michaela (19), and Jake (9) are my nieces and nephews that I spend a ton of time with. I keep Alissa’s school life and activities going during the days while her parents are at work, and they help on the evenings and weekends. Her dad does math for both girls, and her mom does field trips. They also help with Ja’Ana’s activities at times. I’m the PSW for both Jake and Michaela, but focus on one at a time while I’m doing that. I know it’s a bit confusing–I hope this clarifies things. Looks like you had a week to feel good about! Your garden is huge; I look forward to pictures as the season progresses. We are finally warming up in the northern Midwest and I got some peas planted yesterday. I am pleased with the garden size. It is one reason we bought this house, even though it is very small for our family. The garden is quite a bit smaller than our old one, but I’m thinking it will produce enough for our family. Here’s hoping! At least I have my sister’s garden to fall back on if it’s not! Jake is adorable. I agree that firemen are among the super-est of super heroes. You must be very proud of your niece. As always, I enjoyed reading about your family activities. Thanks, Jane. I’m hoping that getting all the craziness down will let me enjoy it more as I look back at it in quieter times! This week was so wild–quite a blur! Wow, you did have a busy week. I read your comments above describing your PSW job, it’s wonderful that you can assist your family in this way and I’m sure the children are much more comfortable with you and your husband than if strangers had to come and do the work. I was able to download a free phone app to track my expenses, I need to be more aware of where my money goes. I also got a free dilly bar from dairy queen for filling out a survey! I hope you had a wonderful Mother’s day. It is much easier because they are my niece and nephew, both for them and for me. 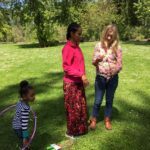 I cannot imagine being at a total stranger’s house as much as I am there, or having to start from scratch with a totally unknown child, although many people do. 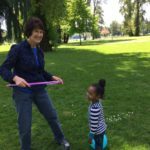 It takes quite a while to figure out a special needs child–there are “triggers” that set them off, and I try my best to avoid them with these kids. With a new child, I feel I would take quite a while to figure things out. I know there is a huge need for PSW’s, and I could gain other clients easily, but I’m much too busy with my own kids and these to even think about taking on more. So, this is perfect for now. Also, when the time is right, I want to build my piano business up again–I haven’t taught a single lesson since last spring and I really miss it. I just can’t make enough with that until I get a large number of students and that takes time to get that built up. When I stopped, I had over 20 students, but moving kind of killed that since we are too far away for any of my old students. I miss them terribly, but am enjoying the extra time with my nieces and nephew, so that’s the good part. The close relationship with them is worth a lot to me. My niece up in Oregon is going to be a PSW for a little girl who is in middle school. She knows the girl and her family so she is getting finger printed and all the other stuff that goes along with that. This also allows her to be home for her littlest since they all know each other. 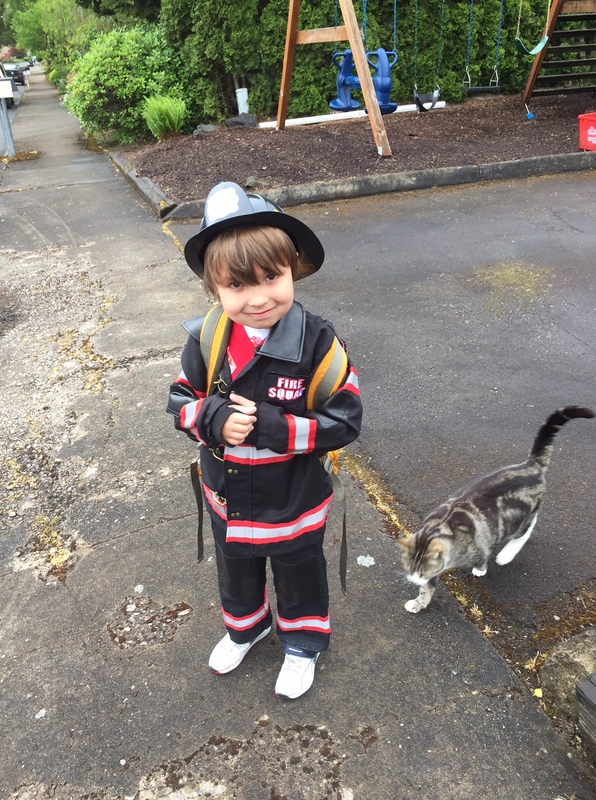 Jake is so cute in his fireman uniform and even a cat. (did he rescue it from a tree – lol) I bet a local fire station would give him a tour – they used to do that when my kids were little and they would probably get a kick out of seeing him in his picture or even wearing his outfit. What a great thing to think of our local firemen as heros – they are but people don’t always acknowledge that. Take care. That’s so funny about rescuing the cat! I never thought of that. Enjoyed your post. Wow, you certainly had a busy week. I’m with you, I’d rather be busy. Some days I have to take it easy due to some health issues. But my preference is to be busy. And, too funny – your swing set in your front yard had me wondering until I saw the picture of your backyard garden. Then i understood why the swing set was by your driveway. 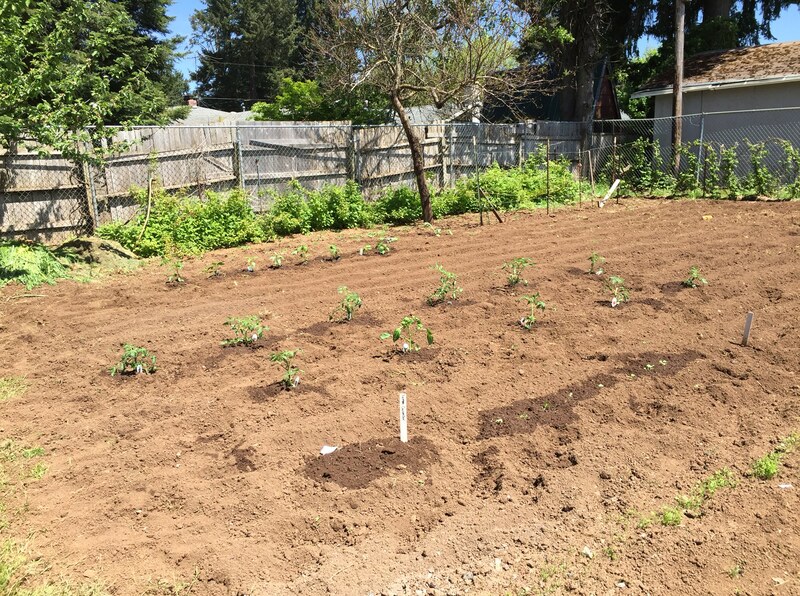 Wow – you have some great space there for a veggie garden. I know you said it’s less space then at your old house but this new garden looks pretty good. Hopefully you get lots of sun as well. Actually, that swing set is at Jake’s house. I know sometimes it’s a bit confusing as to where I live–to me too:), since I’ve over at their house or the kids are at mine so often. I spent a couple of nights over there last weekend while his parents were gone, and put him on the bus Friday morning at his own house. Their swing set is in the front yard because their house is right on the Willamette River, and it isn’t safe for kids to play out back. Jake still isn’t allowed out front or out back by himself. I go out with him frequently to he can get fresh air and exercise as part of my PSW work. If he had his way, I would run around the flowerbed (yes, RUN!) playing “baseball” while he chases me with a wiffle ball, or I chase him, after, of course, whacking away at the plastic balls with a plastic bat. That doesn’t happen often, because it’s a bit much for me, but we do other fun things. Michaela can swing, and does, by herself, although she tries to get me to come watch sometimes. My sister wishes Jake could just go out and play, but it’s just not safe for him, yet. There’s the river in the back and a street in the front. My house yard is fully fenced, so he does enjoy going outside in my back yard when he is over at my house. And, yes, that garden is nice and big. Better yet, the previous owner was a gardener so the dirt is good! That garden is one of the main reasons that we are all squished into an 1100 sq ft. house. Growing a garden is that important to me. This lot is 1/3 acre, so it is big for town. My mother is encouraging me with the hope that at the lower elevation we are at now, plus the good dirt, we will get much more yield from each plant so will have enough. The flowerbeds keep giving me surprises in the form of new perennial flowers that keep blooming. Right now, there are lots of rhodies, Dutch iris, peonies, and a few others. I’ve planted a few annuals–wax begonias and impatients in the shade, and some zinnia seeds in the sunny spot. They are up! I’ve got a few geraniums, and still have a few flowerbeds to figure out. I’m thankful that there are established flowerbeds with lots of bushes, bulbs, etc., but still some room for annuals. I hope your community gardening is going as well as you hoped it would and that you can get in those beds now! When I bought my last house, my son was starting high school so it was all about buying a house we could afford in the same school catchment. High school here starts in 8th grade and we wanted to make sure he went to school with his friends. It was definitely a fixer upper but we made it into a cozy home. But as a gardener, yes it is all about the soil. One of my veggie garden books suggests that for every $1 spent on the garden, $0.70 should be spent on soil and soil amendments. Although I can’t afford that, I agree with the idea. I do try and scrounge up free soil amendments like grass clippings. I wish I lived closer to the ocean for free seaweed! I also save my used coffee grinds and eggshells during the gardening season and use those as amendments. And,yes my gardens are starting to produce – asparagus, various lettuce, kale and spinach. I have radish up as well as snow peas, hot peppers, tomatoes and eggplant. The last three I bought in 3inch pots. And, joy of joys, my strawberry plants are all very healthy and have tons of flowers. I redid my strawberry bed at the end of last summer and it looks like it will be paying off in spades. These strawberries are ever-bearing which I really like. once they start producing, I’ll have berries for two months. To make jam, I add fruit to a bag in the freezer and make jam when the weather cools. I love overbearing strawberries, too. I, also, just freeze what’s extra in little cartons, and just add to them when I have another handful. It sounds like you are getting lots of good stuff from your gardens. I agree with getting what you can to amend the soil. Right now, Patsy is spreading 3 bags of Starbucks coffee grounds onto the rhodies. They like acid, and so everytime we can, we get more free grounds for gardeners, and do a couple more bushes. I hope to get to them all before too long, but let me tell you, these people loved rhodedendrons and there are LOTS! Beautiful. But, I may need to spring for some fertilizer if I can’t get enough grounds. It feels good to use “garbage” for a good purpose. I looked out and, yup, it’s raining again this morning. It is nice when you first plant seedlings to get that daily moisture to get them to come up, and to water the little plants that have been planted. I have high hopes for the end of the week–they are promising sunshine so everything should grow like crazy! Here’s hoping. I noticed the lei as well, but don’t know why she has it. Some of our family members regularly spend time in Hawaii, but only as guests–so I’ll have to ask her where she got it. It is beautiful, for sure.